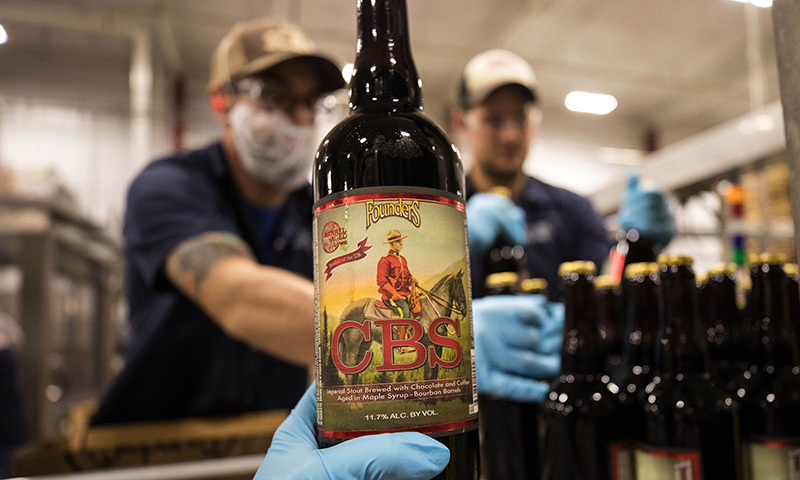 New Barrel-Aged Series Release: CBS - Founders Brewing Co.
Posted on November 6, 2017 by Founders Brewing Co.
CBS will be available everywhere (yep, all 46 states we’re available), including our Grand Rapids taproom, on draft and in 750mL bottles beginning on December 1 – some markets may release it a few days after that date. It will have a suggested retail price of $24.99 a bottle. Special thanks to our enthusiast club, the Cadre for helping announce this release by sharing our hint on Twitter and Instagram. Also, for those of you who caught our CBS ‘trailer’ on Friday, know that that wouldn’t have been possible without the help of lovely Reya (the horse), her owner and trainer, Lisa Anes-DeLaat of Performa Dressage, and our kickass Mountie, Angela Walser. Mug Club presale ticket info will be sent via email today, 11/6/17. Check out the other beers in our Barrel-Aged Series here. No presale tickets for Cadre members? Yes, an email will be going out later today with ticket sale info for Mug Club members. No, we only offer presale opportunities for our Mug Club members at this point. Thanks for bringing this to our attention. We always do bottle ticket sales on Saturdays to make it as accessible to the largest group of people possible. We chose the 11th as it would be the first Saturday after our official CBS announcement and we knew our fans would be anticipating the ticket sales right away; after all, the release is only weeks down the road. In our choosing of that day/time, we failed in doing our due diligence of ensuring it wouldn’t coincide with a significant event such as the moment of silence for Canada’s Remembrance Day. Unfortunately, it is too late to change the date and time, but please know that this was an oversight on our part and we are deeply sorry. We have the utmost of respect to those who serve their country and we would never intend to minimize that. Thanks again for making us aware of our error. Is there any information on where I can get it near me? South Bend, Indiana? Thanks. Your best bet is to check with your local bottle shops and ask if they plan on carrying it. Also, check out foundersbrewing.com/events for tappings near you – a release this big will have tons of events celebrating the tapping! How much of the CBS will you have on tap in the tap room? I plan on making the drive up for the event, but won’t arrive until late evening. We plan on having it on tap throughout the weekends that correspond with bottle pickup. Really appreciate the bonus for mug clubbers, looking forward to the email! Hey, it’s the least we could do for our local loyalists! Do you get to choose your day? Are tickets for a specific day or can you pick up anytime during the weekend for a given ticket? The tickets are weekend-specific – either 12/1/17-12/3/17 or 12/8/17-12/10/17. You can come at any point between 11am and 9pm on the weekend specified on your ticket. Love it! Thank you Founders! Do you get to pick the day for your ticket? Or is it random? The bottle pickup time is specific to one of two weekends (12/1/17-12/3/17 or 12/8/17-12/10/17). You can come at any point between 11am and 9pm on the weekend indicated on the ticket. Understood that tickets are weekend specific. But at the time of purchase, does the buyer get to select which weekend based on avaialbility or is the specific weekend randomly generated? Is any CBS heading to Ontario, Canada through the LCBO? I asked the LCBO directly and expect to hear back never. It sure is! You can expect it sometime in mid to late December. Any chance CBS makes it way out to Los Angeles? yes or no. When you purchase your ticket,will you be able yo pick the weekend you want to pick up your bottles. Will you be releasing any 4 packs? I have been saving the 4 pack itself to make a solid framed picture with all 6 once the release ends. This will pretty much put that to an end. On the release date (12/1) will CBS also be available in stores? Do you have to have the card present with you that was used to purchase the ticket, at time of beer pick-up? Last year for KBS release, you required name on credit card to match name of person picking up the beer, is that a requirement for CBS? Cam we pick up CBS on opposite weekend of our tickets? I never received the mug club member presale email. I live in Baltimore Maryand. Any CBS coming this way?